It has been decades that Iranian pro-democracy movement is fighting the Islamic Republic of Iran (IRI), a regime that unlike Shah's regime, has no international support, nor does it have powerful programs and capable cadres to rule Iran. The main reason for the failure of the movement is because the opposition has become synonymous with two anti-democracy forces, and those two forces are Prince Reza Pahlavi's monarchy and the mojahedin khalgh organization (MEK). Every time the Iranian people were able to overthrow IRI, because of the fear of possibility of these two forces coming to power, they hesitated to take the last step to end IRI, and this way IRI has stayed in power for decades. If with the help of the U.S., monarchy or MEK come to power in Iran, the next day, people will go to the streets chanting, down with that regime. The problem is not the uniting of political groups with monarchists and MKO, our issue is that unity with these two forces, will block the unity of Iranian people, who hate these two forces as much as they hate the current Islamic Regime ruling Iran. Iranian pro-democracy movement does not need Prince Reza Pahlavi, to tell us about human rights and the dictatorship of IRI. We have fought Pahlavi dictatorship for over half a century, a regime that Mr. Reza Pahlavi wants to restore for us. Consequently, why should the people make the same mistake, as in 1979, and to bring a force to power that has been the executioner of our pro-democracy movement. On the other side, MEK wants to bring its own version of Islamism to power in Iran, and doing it decades after the imposition of another version of Islamism by IRI. Why should we want to bring to power the Islamism of MEK, that had fought alongside our enemy Saddam Hussein in the Iran-Iraq War, and has been as bad as IRI with respect to its human rights records. Monarchy and MEK even before coming to power, are mafia type organizations, where they send their agents, like Sha'boon Bimokh, and attack the pro-democracy forces with dirty words, while their leaders Prince Reza Pahlavi and Ms. Mariam Rajavi, talk nice and pretty in TV interviews, the same way hezbollaahis attack intellectuals, and Ayatollah Khamene'i claims not to know about it, smiling pretty in TV interviews. 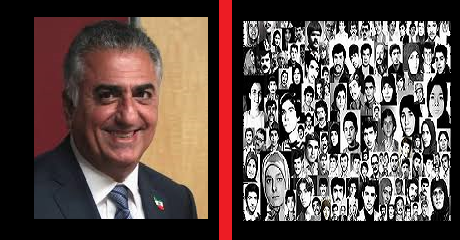 Prince Reza Pahlavi is Iran's Ahmed Chalabi who wants to use the U.S. to get to power, and MEK is the Khmer Rouge of Iran, but an Islamist version of it, and Iranian people are very aware of it, and do not want to allow these two forces to get a chance to come back to power in Iran. The best Mr. Reza Pahlavi can do is to announce the dissolution of monarchy in Iran, and the best Rajavi's can do is to dissolve mojahedin organization (MEK), because these two forces are the main obstacles blocking the success of Iran's pro-democracy movement to end IRI and to form a secular democratic and futurist republic in Iran. Many of those who have joined these two forces, have done so in order to end IRI, and to form democracy in Iran, and the dissolution of these two cults will help to free the honest people in their ranks, to join the pro-democracy movement, instead of wasting the time of themselves and others with the Myth of Democratic Monarchy, or wasting their energy in the activities of MEK against the Iranian pro-democracy movement. The forces of Iran's pro-democracy movement, clearly and in no uncertain terms, have asked Prince Reza Pahlavi to abdicate from the throne, and he evaded their calls, and continued his game of dual role of private citizen and future king, and the movement left him behind. Once it was obvious the objective of his dual role is to deceive the people to restore monarchy in Iran and he has now clearly acknowledged his goal to be the restoration of dictatorial Pahlavi Regime in iran. Iranian people do not want monarchy. All the complaints of Iranian people during Khatami and the Sixth Parliament of IRI revolved around the issue of VF (Valie Faghih) and GC (Guardian Council) which are like monarchist institutions in the IRI law, and are not elected offices. People in their demonstrations, even express their resentment of Ayatollah Khamene'i, by calling him the new Shah, then how can they want restoration of monarchy, when the opposition of people to Khamene'i, and Khomeini before him, was exactly because of VF having a role similar to a king in the Constitution of Islamic Republic. To any impartial analyst of Iran, it is clear that Iranian people do not want monarchy, and thus how could this obvious reality be hidden from the eyes of Prince Reza Pahlavi, except that he is after the interests of the Pahlavi throne, so that with the help of the U.S., and using his formula of referendum, defining it as a choice between republic and monarchy, in the agitated environment of fall of IRI, to reach his goal of return of Pahlavi monarchy. Iranian people know that Monarchy Means Discrimination Based on ancestry. It is exactly this dreadful prospect that has made the Iranian people to hesitate to fully support the plan of referendum, and also this is the reason why Reza Pahlavi spends his time to talk to the foreign press and officials, rather than to talk to Iranian intellectuals, because he knows monarchy is finished for the Iranian people, and wants to restore it and come to power by the foreign forces. Nonetheless, times have long passed, since the days that Iranians did not have secular republican organizations, and monarchy and MEK could show themselves as the representatives of the people. One good thing that happened during all these years of Khatami, is the fact that new secular organizations were formed in recent years, organizations that have the trust of people. The republican secular democratic organizations today, are more organized, than all the years of 1953-1979 of Shah's time. Those from the past democratic opposition movement who are serving the monarchists today, are making a big mistake, to promote the "all-together" slogan of Khomeini today, this time from Prince Reza Pahlavi, when the functionaries of the past regime, are trying to use them to come back to power, the same way that Khomeini used them by his "all-together" slogan. As far as MEK, even raising the posters of Shariati in the students' demonstrations of Oct and Nov 2002, damaged the popular support for the students. Shariati is a reminder of IRI and MEK, and the people resent Islamism whether by IRI, MEK, or others, and they want full secularism, republicanism, democracy and futurism. Iranian people have said it time and again that they do not want Khatami, because he does not want a *secular* republic for Iran, then how could they want an Islamic government of mojahedin which is another form of Islamism, and even knowing about the violations of human rights by them against former members, and their cooperation with Saddam during the Iran-Iraq War. If the U.S. helps IRI, monarchy, or MEK in Iran, the hope of Iranian people in seeing the U.S. as the ally of Iranian pro-democracy movement, will be diminished. Just think about it, if the U.S. tried to support the royalists of France to come to power by U.S. military assistance, because of its conflicts with the current French government, then the French people would hate the U.S. forever for doing that. Iranians just like Americans, want to vote for president in a *secular* republic. When secular republic is so important for Americans themselves, why some U.S. officials prescribe monarchy for Iran. I hope the U.S. to tell Mr. Reza Pahlavi in clear and no uncertain terms, that the U.S. will not help the coming to power of monarchy in Iran, and if he wants to join the pro-democracy movement of Iran, he should announce the complete annulment and dissolution of Iranian monarchy. The same way, if any member of mojahedin wants to join Iranian pro-democracy movement, they should dissolve MEK, and either form democratic organizations, or join the existing pro-democracy organizations. Monarchy and MEK have delayed the success of pro-democracy movement of Iran in ending the Islamic Regime and forming a secular democratic and futurist republic in Iran.